If you want, pay now just 30€ and leave the rest for the day of flight. Print tickets (Have a look to the three options for giving the present). The owner of the ticket will schedule his favorite date and flight zone. *So, if you want to make an original gift , you can buy tickets without compromising one day and flying spot. 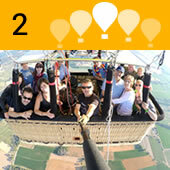 Those benefiting will be to decide when and where to fly, into our net with codes for each flight ticket. 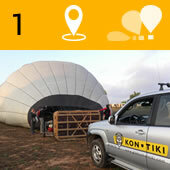 Preparation & Inflation of the balloon. The activity begin early in the morning when, after introductions and some instructions we all participate in the inflation of the balloon, a magic experience. Taking off & Flight. After half an hour we are ready to take off. First ungravity moment is unforgettable. We'll fly during one hour and a half aprox. and the itinerary will be decided by the wind. Landing & Retrieve. Our 4 wheel drive car will follow us communicated by radio, they will pick we up after landing. Friends who don't wish to fly can participate in the activity in our 4 wheel drive car as well as in the cellebration lunch. +EXTRA Option . 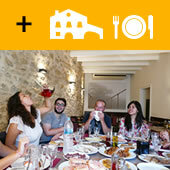 We will celebrate the experience in a typical countryside restaurant with a typical Catalonian lunch with champagne and a flight certificate and a pendrive with the recording of the photo report of the journey. Towards noon we will finish the activity.